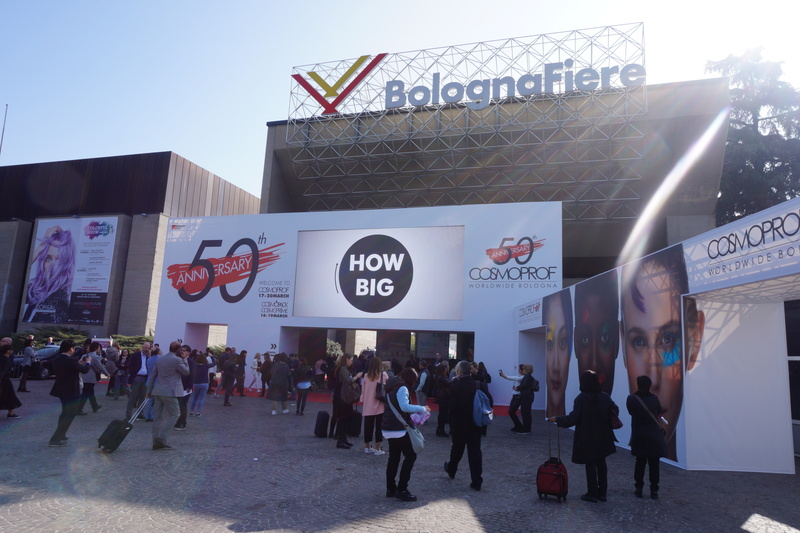 To celebrate the 50th anniversary of Cosmoprof Bologna, BolognaFiere launched an entirely new trade show section: Cosmoprime in Hall 19! 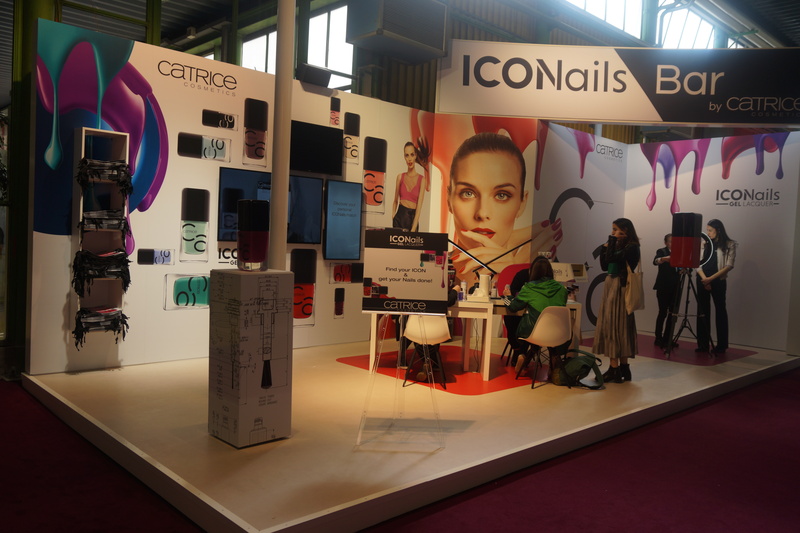 This exhibition area featured 151 brands and companies and presented some very cool themed showcases which were inspired by features from other international Cosmoprof fairs. The multi-ethnic beauty showcase Tones of Beauty – which premiered at Cosmoprof North America a few years years ago – presented nine international “black & brown” beauty brands – i.e. companies specialising in beauty products and colour cosmetics for non-Caucasian skin tones and hair types. 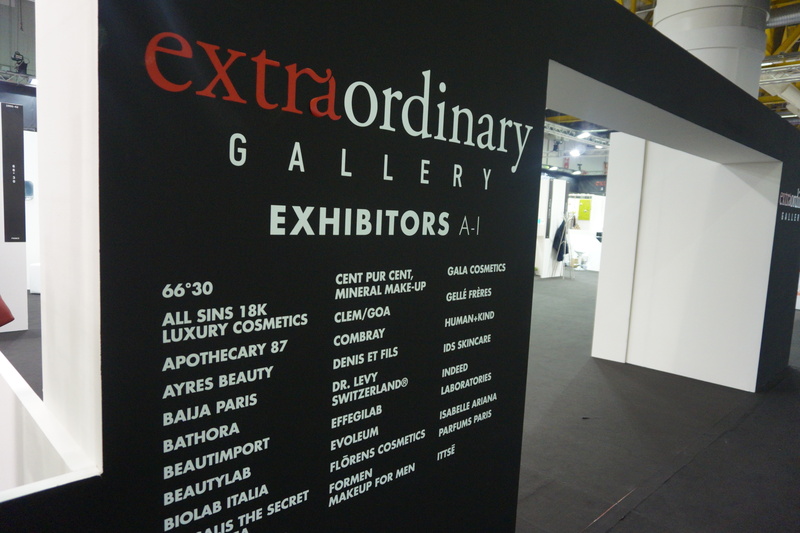 Extraordinary Gallery (I had seen this concept at Cosmoprof Hong Kong) assembled innovative and niche beauty brands from around the world. 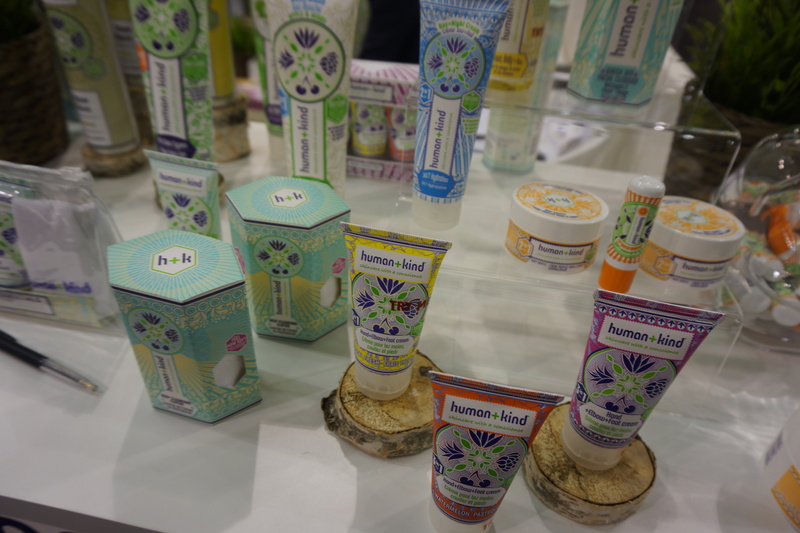 The 50-odd exhibitors included several brands I knew and liked: organic brands Bio Happy from Italy and Panacea Urban Apothecary from Romania (I had met them at last year’s Cosmoprof Bologna) and May Coop from Korea. 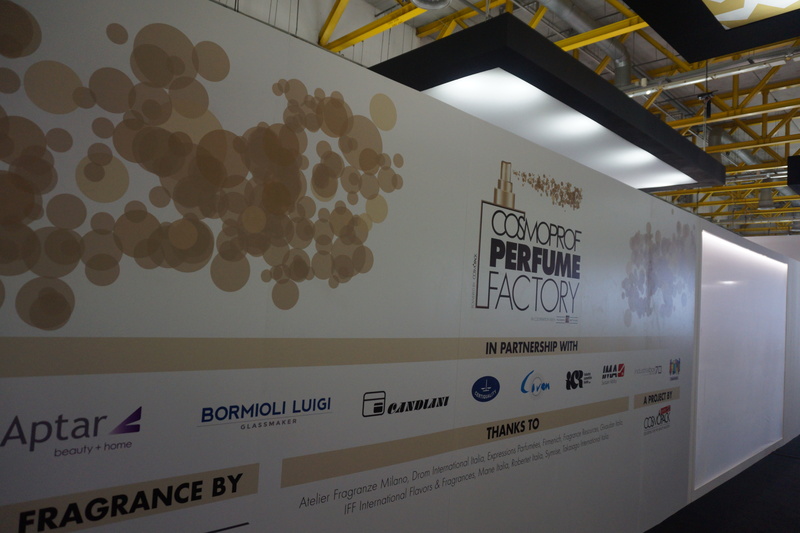 And The Perfume Factory – a communal project of several Italian exhibitors – presented an entire supply chain which showed every step in fragrance manufacturing: the maceration of the ingredients, filtration, bottling, assembling the outer cardboard packaging. Very interesting. There was also the Cosmotalks room where most of the lectures and seminars took place, the Glamour Me section which offered makeover, manicures and hair stylings, and the Be Organic niche brand show case. And now let’s go straight to my brand discoveries! Oh K! is a UK face mask manufacturer – K-beauty style! I initially thought this was a Korean brand; the packaging is so cute! However, Oh K! is based in London although the masks are produced in Korea. The company was founded in 2016; initially launched with a bespoke collection of beauty accessories for UK fashion retailer TopShop. Now Oh K!’s products are also sold in UK drugstore chain Boots, in France’s Monoprix stores and online on Asos. 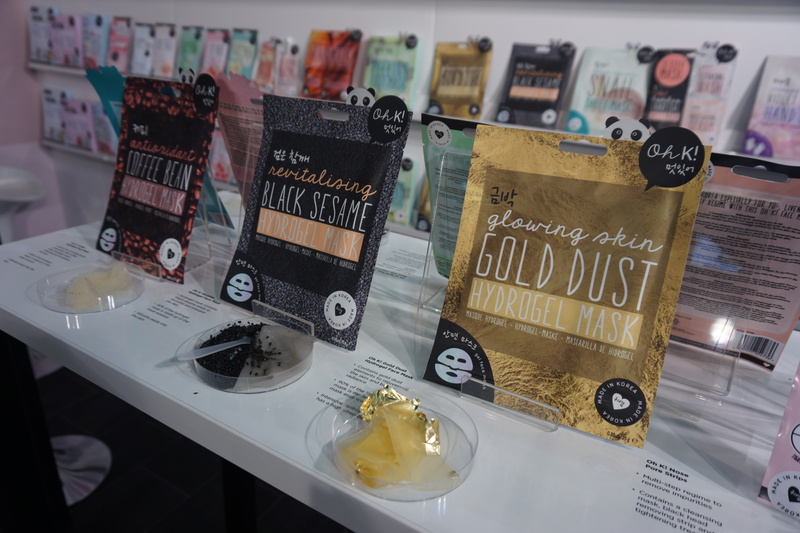 The brand’s face mask section Korean Mask Edit offers a wide range of different face masks: sheet masks with snail secretion filtrate, avocado, egg white or cucumber as key actives, hydrogels with black sesame, coffee bean extract or gold dust (the gold dust hydrogel mask is one of Oh K!’s bestsellers); sheet masks for different parts of the face and body – foot, hand, lips, eyes etc. ; a creamy sleep mask, a cream hair mask complete with heat retaining cap plus a whole range of beauty accessories which are just as cute as the sheet mask packaging. A charming brand who is now looking to expand its European distribution. 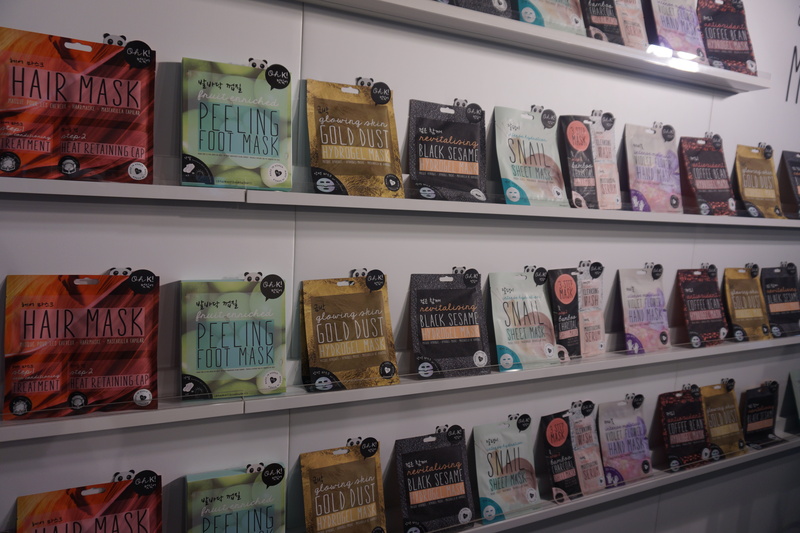 I’ve written about my favourite Taiwanese sheet mask brand Maskingdom many times over the past years– check out the articles about Maskingdom’s Taipei flagship here and here. 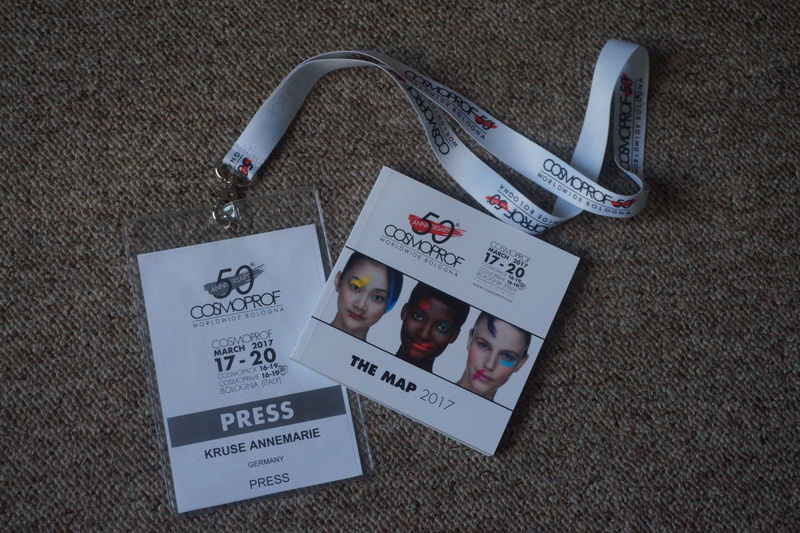 I meet the brand at Cosmoprof Hong Kong every year (read my reviews of Cosmoprof Asia 2014, Cosmoprof Asia 2015 and Cosmoprof Asia 2016 here) and last year they were at Bologna for the first time, in the Taiwanese country pavillion. 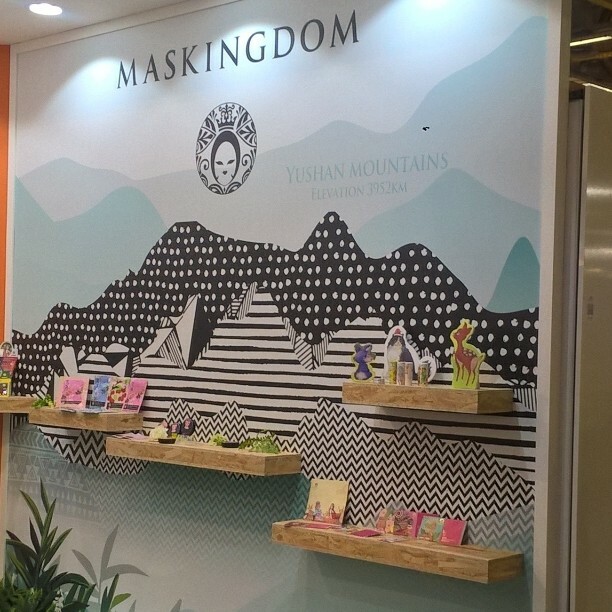 This year Maskingdom had an exhibition booth in the Cosmoprime area – the perfect place for such an unusual and exquisite mask brand. The company is well-known for its beautifully designed and packaged sheet masks which feature Taiwanese ingredients; with packaging design and artwork by young Taiwanese artists. 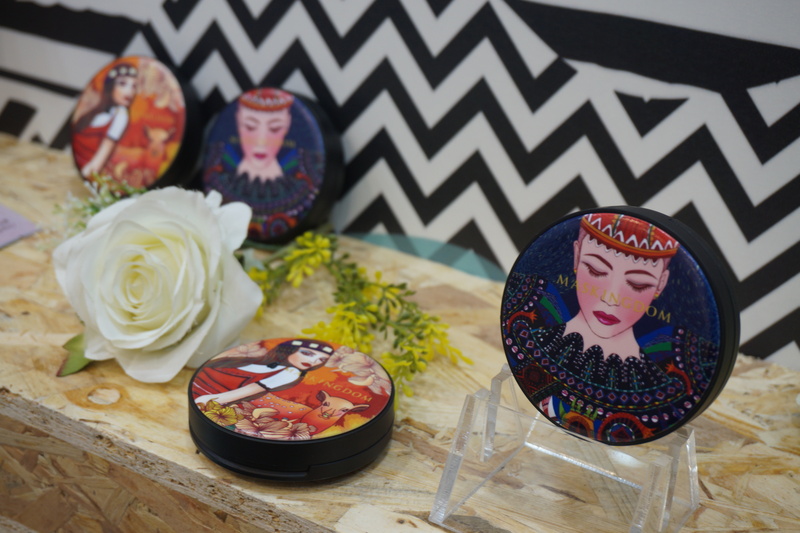 Maskingdom’s Aboriginal mask series (a range of face masks dedicated to the different aboriginal tribes in Taiwan) received a Red Dot Design Award last year. At Cosmoprof Hong Kong 2016, Maskingdom had introduced new three face care ranges and at Cosmoprof Bologna 2017, they presented a range of aromatherapy massage candles and two fabulous travel cosmetics products: Organic Cleansing Flakes – soap-free, alcohol-free paper cleansing disks which dissolve into foam upon contact with water– and Makeup Cleansing Cottons, soft cotton sheets infused with a cleansing lotion which is “activated” with water. I was particularly impressed with the Cleansing Flakes: round discs of soft, structured paper (so unlike the stiff “soap sheets” which were popular in Germany around 20 years ago!) – place one disc in the palm of your hand, add some water and rub your hands together. I swear, the paper dissolves almost immediately and it foams up! Unbelievable! There are no sticky paper bits left, the entire thing turns into a surprisingly creamy foam. The Flakes are packaged in a plastic compact (see picture above) which is perfect for travelling, and has an extra lid inside which keeps the paper disks from turning mushy should they come into contact with moisture or humidity. Excellent product design. First-time exhibitor Ecooking from Denmark was launched in 2015 by Tina Søgaard. 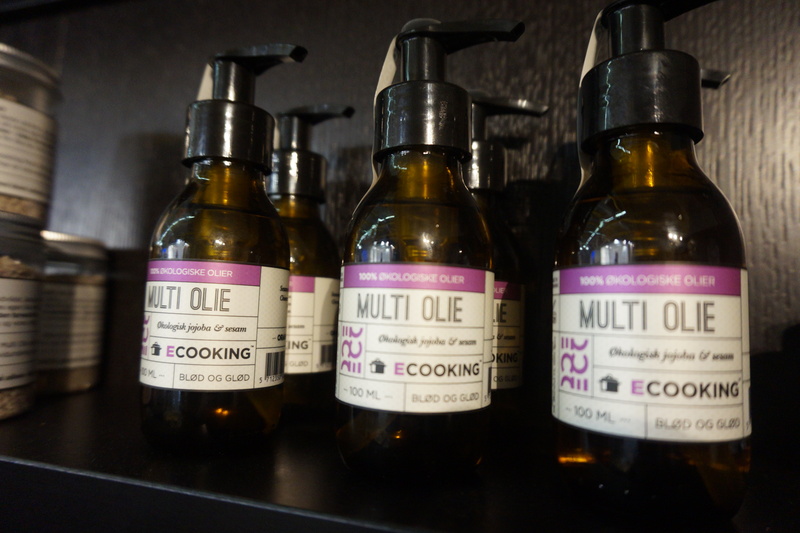 Tina began by stirring up the first products in her kitchen – hence the name Ecooking – and today her brand offers 15 sku of face care and three men’s products. The cosmetics are not organic but they are fairly natural; the packaging is stylish and minimalistic – so Scandinavian! In Denmark the products are sold online and offline in around 500 pharmacies. Now the company is looking to expand its international distribution. Human + Kind was one of the exhibitors at Cosmoprime’s Extraordinary Gallery. I had seen the products of this Irish brand at Vivaness trade show in Nuremberg a couple of years ago. Over the last few years, the company has really expanded internationally, they just launched in the US market (in outlets of the Ulta pharmacy chain – nice!) and in Romania; Austria was added in 2016 and the expansion into the Czech Republic will also happen soon. In Germany, Human + Kind is primarily available online, through perfumery chain Douglas’ online store and online perfumery Najoba. Another interesting exhibitor in the Extraordinary Gallery was May Coop from Korea. 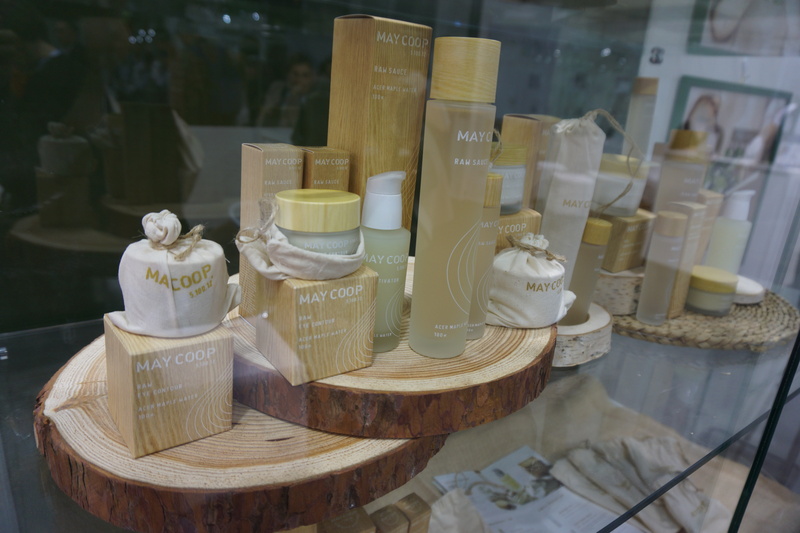 I had read about his brand; May Coop’s Raw skin care range is enormously popular amongst international K-beauty fans and bloggers. In its domestic market, the brand is available in various duty-free stores and selected perfumery outlets; in the US, May Coop is sold in perfumery chain Sephora’s outlets (the products are also available through specialist K-Beauty online retailers like Peach & Lily).Now the company is preparing for its market entry in Europe! 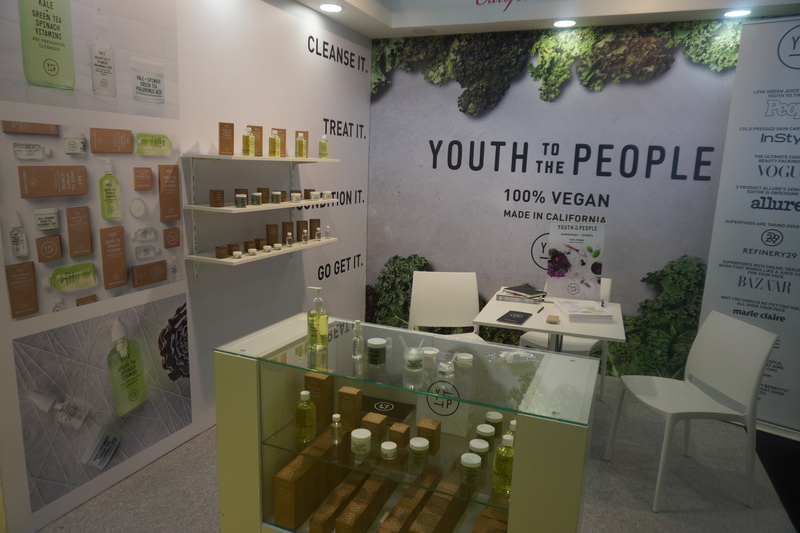 Cosmoprime also offered a special exhibition area for organic niche brands, the Be Organic showcase. Unfortunately this section was located at the very end of the hall – it really should have been based in between the main entrance and the Extraordinary Gallery! 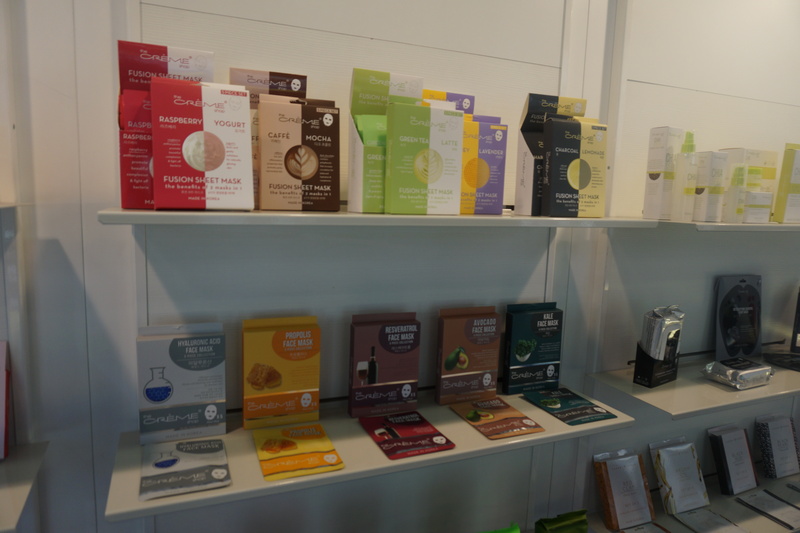 – so I only noticed the charming line-up of organic niche brands on my second visit to Cosmoprime. There were some well-known faces, like Latvian hydrosol brand Dabba which I know and love (their new raspberry seed face oil is divine!) and Australian mineral makeup brand Inika. However, my favourite new brand discoveries in this part of the show were French premium niche brand C.Lavie and Hemptouch from Slovenia. C.Lavie was founded in July 2016. The packaging is beautiful – so déco; I love it! 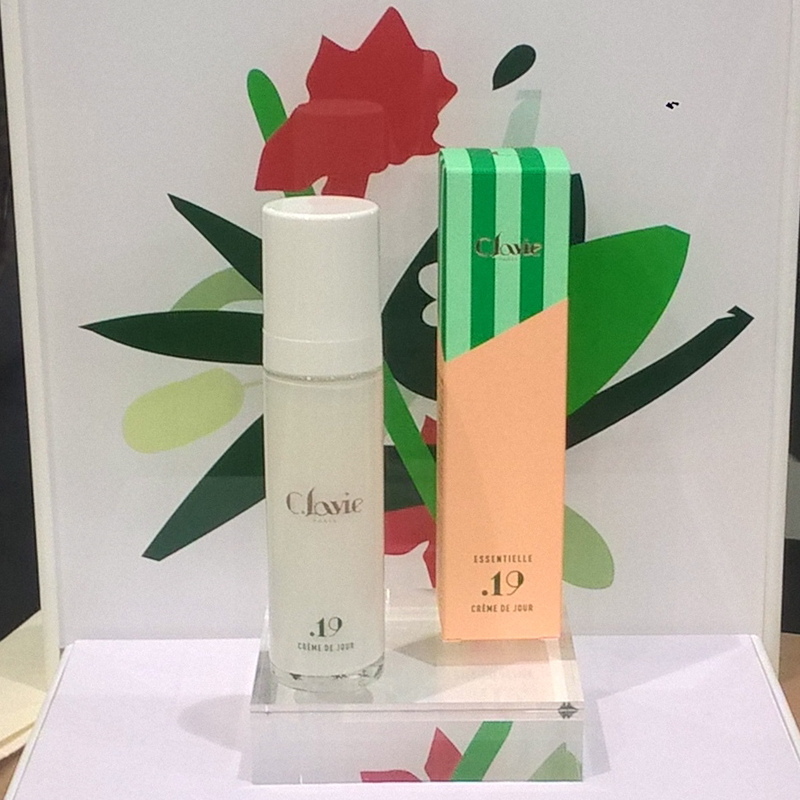 – and C.Lavie’s line-up of three products includes the .11 Eye Cream, the .19 Day Cream and the .21 Serum Éclat. The figures in the product names refer to the number of ingredients – nice touch! – and the textures are amazing. The preservative used in the cosmetics is a silver-water suspension, by the way. I was told that there will be two new products soon, a night elixir and a micellar water. The products carry a seriously premium price tag but are selling well nonetheless; the brand already has a distributor for the US market and now C.Lavie is looking to expand their distribution in Europe as well. And Hemptouch is a charming organic indie brand which is based in Novo Mesto in South Eastern Slovenia. The young company specialises in cosmetics formulated with hemp which is cultivated and harvested on their own farm. 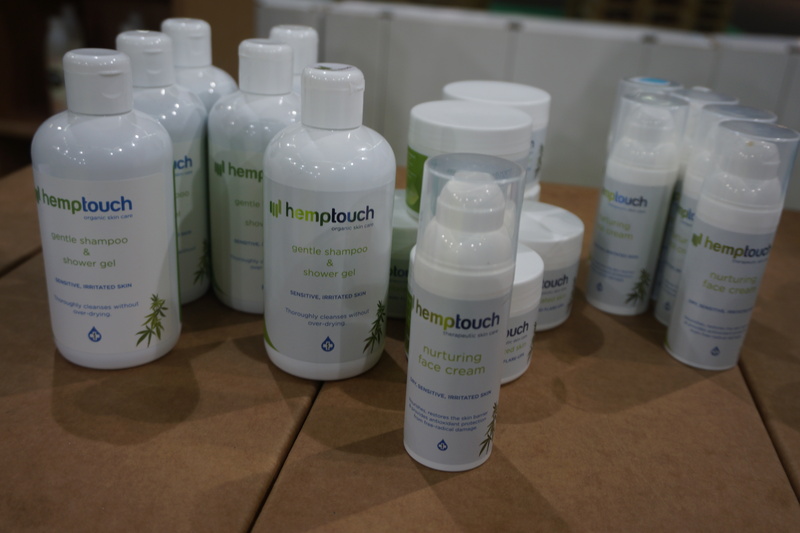 All Hemptouch products include three hemp-derived ingredients: cold-pressed hemp seed oil, hemp hydrosol and hemp cannabidiol (CBD). Hemp is particularly beneficial for problematic skin types – especially atopic, dry and irritated skin but also acne-prone and oily skin – and Hemptouch offers a targeted 6-sku range of cosmetics which addresses the needs of both skin conditions. The line-up includes a gentle shampoo & shower gel and a purifying face cleanser and two face moisturisers – a Calming Face Cream for oily and acne-prone skin and a Nurturing Face Cream based on hemp hydrosol for sensitive, irritated skin types. Finally, there are two buttery-firm Ointments based on mango kernel butter, shea butter and hemp oil. A little goes a long way with these butters; you only need a small amount. In addition to the six cosmetic products Hemptouch also offers four different Raw Hemp Drops, liquid supplements which contain 5% CBD. In Slovenia, Hemptouch products are retailed in organic stores and the brand recently expanded into the Netherlands, too. Now they are hoping to find distributors for Austria and Germany. I’ll keep my fingers crossed!! TV shopping channel QVC also had a booth at Cosmoprime. Initially I was surprised to see QVC at the trade show – yes, I know that QVC retails a lot of beauty products and that TV shopping is an enormously successful retail channel for consumers goods but still, I mean, QVC?? In a trade show section that is highlighting unusual and niche brands? 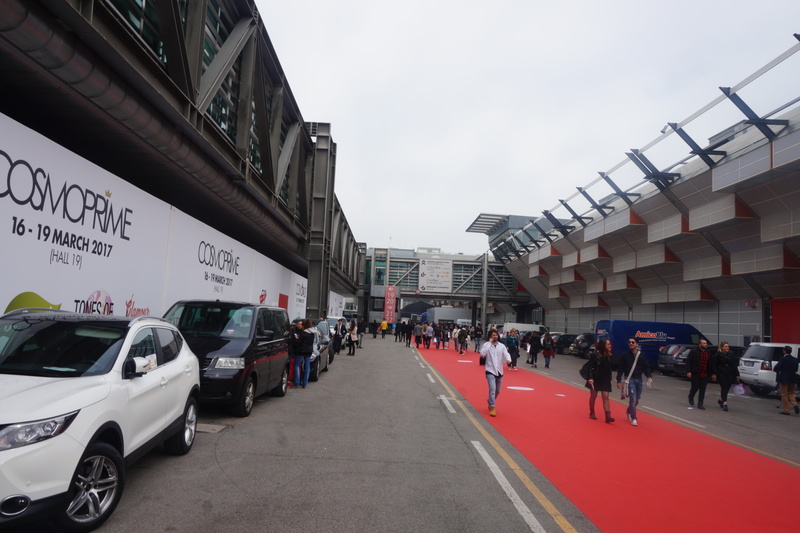 However, it turned out that QVC Italy was there to promote a really interesting new initiative, QVC Next: scouting new and innovative small and mid-sized enterprises from Italy – with a particular focus on businesses run by women – and help these small companies to get off the ground. Offer them support and a distribution infrastructure as well the opportunities of major multi-channel retail and social media network. And not just throughout QVC Italy but potentially also in QVC’s other international markets. Sounds like a great project and if I understood the Italian press release correctly, QVC Next might also be introduced in Germany, either this or next year. 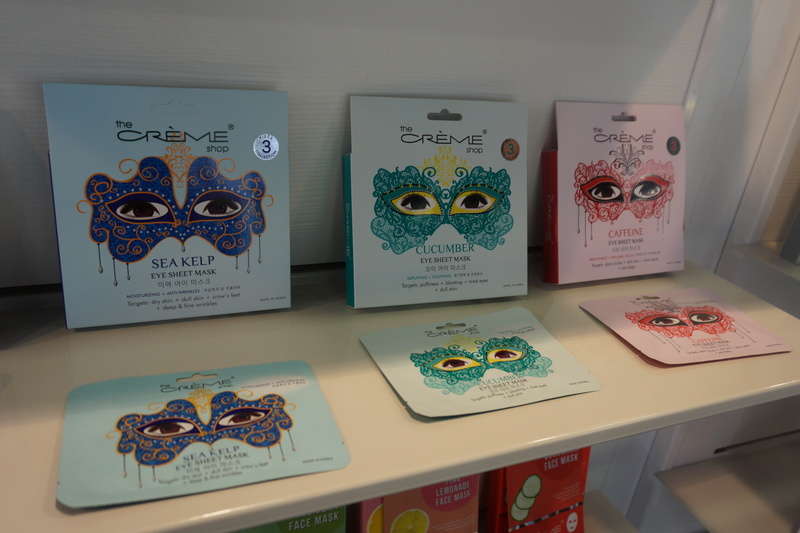 The Crème Shop is a K-Beauty company from the US and they were at Cosmoprof Bologna for the first time. I had seen The Crème Shop’s sheet masks and beauty accessories at German TK Maxx stores and always assumed that the brand was Korean. And they are, in a way! The Crème Shop started with private label manufacturing in 1988. In 2007, the company launched the first beauty products under its own brand – sheet masks, face care, eyelashes, nail products and accessories. Products are manufactured in Korea but the company is headquartered in LA. Who knew! Anyway, in the US market The Crème Shop’s products are sold in drugstore chains CVS and Walgreens and in many apparel retailers. And now they are planning to increase their distribution in the European marketplace. The brand’s latest launches include a superfoods sheet mask range formulated with, respectively, hyaluronic acid, propolis, resveratrol, avocado and kale. And there were more superfoods just one aisle further down! Youth to the People is a minimalistic-looking superfoods-based skin care brand from Los Angeles. They’re still a very young brand – the company was launched in 2015 – and the entire five-sku range is vegan and manufactured in the US. In its domestic market, Youth to the People is retailed in perfumery chain Sephora and department store retailer Nordstrom. Although the cosmetics are not organic they are free from parabens, sulphates and phthalates. The line-up includes a cleanser, a cream, a serum, eye cream and mask; with products priced between 35 USD for the eye cream and 62 USD for the serum. I like the clean and stylish packaging. Another nice little brand in the California pavilion was Blue Beautifly. 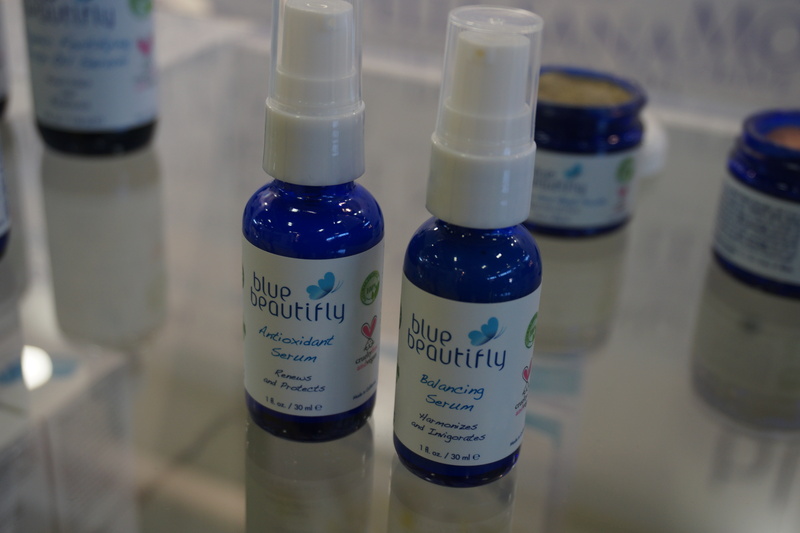 Blue Beautifly was launched in 2010 and its products are sold online and in various spas in the US. Certified by the USDA and BCorp, the brand’s portfolio includes two facial cleansers (priced at 28 USD for 59ml), three solid scrub bars which offer different levels of exfoliation, two face serums and two oil serums (48-52 USD for 30ml), a moisturising cream for normal and dry skin and pure argan oil plus three clay-based powder masks. There are also two eye serums (36 USD for 15ml), two body oils (around 50 USD for 118ml), a scalp oil and a roll-on deodorant. Sukin is a natural beauty brand from Australia which already has a solid international distribution. In October 2016 Sukin was launched into UK drugstore retailer Boots, the market leader of the UK drugstore and perfumery market. In Germany, Sukin’s products are occasionally sold in TK Maxx stores; I currently have the brand’s Micellar Water at home and really like it. It takes off the eyemakeup and doesn’t sting, what more do you want! Anyway, Sukin’s latest product launches include a duo of body care products: Energising Body Scrub and Renewing Body Scrub. The company is looking to expand its distribution in Europe, especially in the Western European markets like Germany and France. 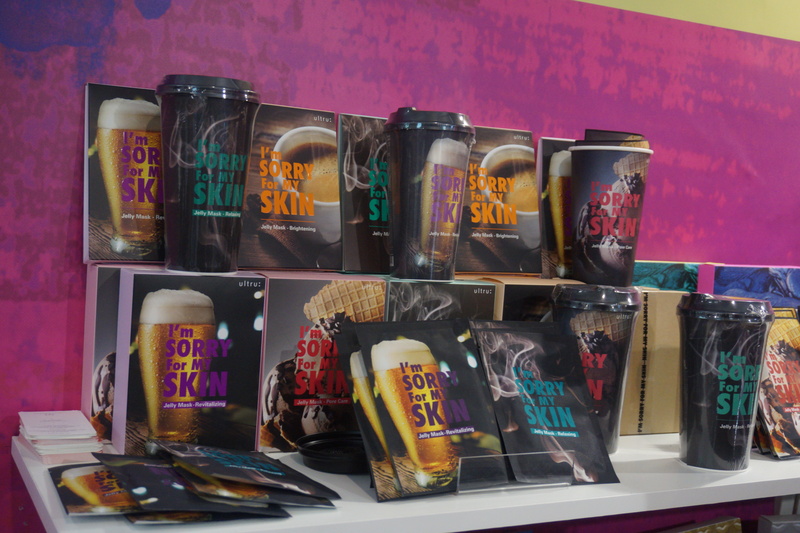 There were a number of Korean exhibitors that I already knew and liked – like skin care brand Scinic. 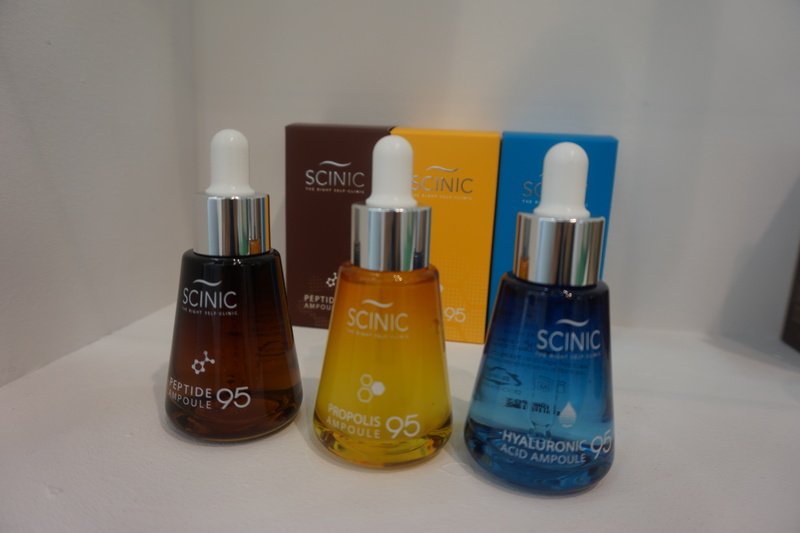 Scinic was launched in 2003; their first product was a powder wash. Today they are a very high-profile beauty brand indeed, with a large international fan base which includes me; I love the Hyaluronic Acid Ampoule (the blue bottle on the right) and stocked up on this excellent serum the last time I was in Seoul! I knew that Scinic is popular with K-beauty fans in the US, China and Taiwan but I had no idea that the brand’s products are also distributed in Mongolia, Russia, Kazakhstan, Russia and Turkey. Now Scinic is planning to expand their distribution within Western Europe. Very cool! Korean mask manufacturer IM1NE is the company behind the fabulous I’m Sorry for My Skin mask series. I had first seen these masks – check out the awesome pack design! Each masks pack shows one of the typical causes for problem skin; smoking, eating, drinking too much…! – at a Boons drugstore in Seoul last May; then I saw IM1NE at Cosmoprof Hong Kong 2016 and now they were at Cosmoprof Bologna 2017. The company is an OEM/ODM manufacturer, they were founded in 2006 and produce face masks for some of the biggest Korean beauty brands and the own label ranges of retailers like Olive Young or Boots. Now the company is looking to expand into Western Europe – and judging by the crowds of visitors clustering around the IM1NE booth, they’ll probably manage to do it! 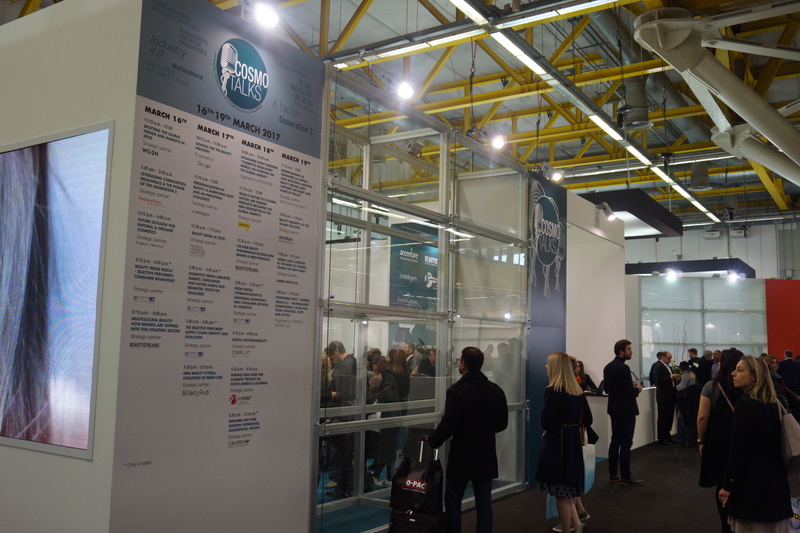 As always, German C&T manufacturer Cosnova’s exhibition booth at Cosmoprof Bologna was spectacular. 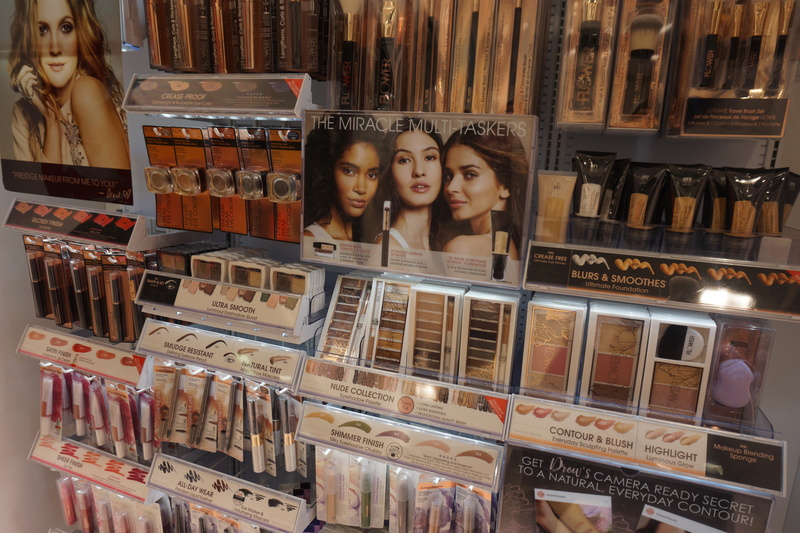 The company has three main colour cosmetics brands: Essence (teen-oriented budget beauty), Catrice (more sophisticated and mid-priced) and LOV (elegant; masstige price segment). There were several activity areas. 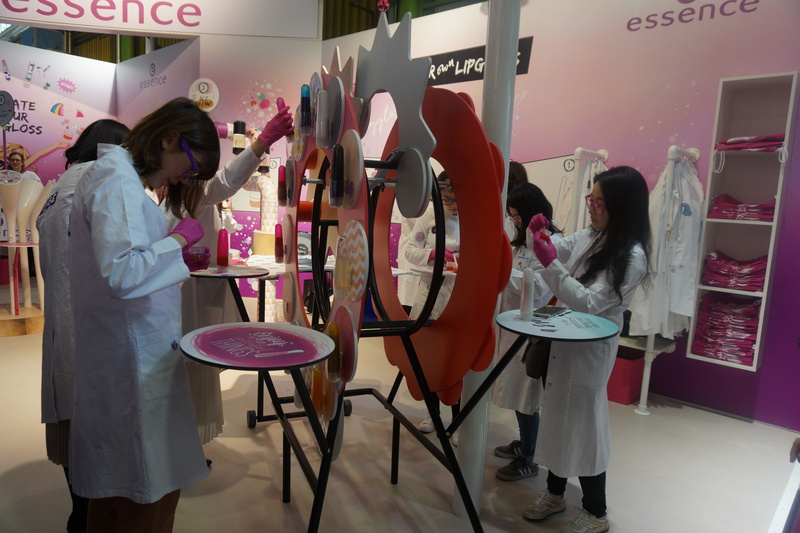 At the Essence “Mix your own Lipgloss” area (picture below) visitors could don a white lab coat and blend a personalised lipgloss – it was rather fun, actually; first you select which colours you want (I opted for cherry red with a hint of white), add different types of glitter and/or shimmer and then the fragrance of your choice. Vis-à-vis Catrice presented its latest nail polish launch: ICONails, a stylishly packaged range of 42 shades which will launch on 1st May. To promote the new range, Cosnova had installed a kind of photo booth which took a headshot, analysed the colours of your skin, hair and clothes and then suggested suitable nail polish shades. And LOV had a beautifully decorated backstage area – check out the picture below; it’s like an art installation! 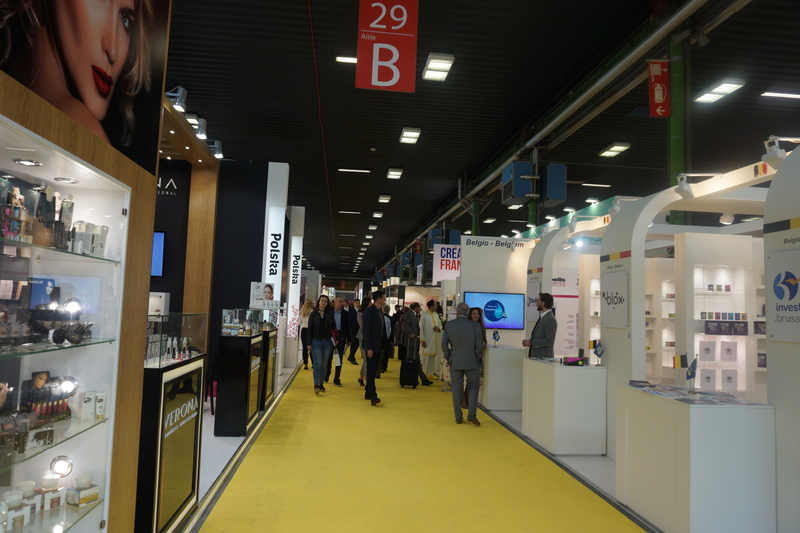 I also checked out Halls 22 and 26 (perfumery and cosmetics) but these halls mostly featured the gigantic exhibition booths of the major European and US beauty manufacturers. Most of which I knew already. However, I simply had to stop at Spanish company Maesa’s stand. Maesa acquired German colour cosmetics brand P2 a few years ago – although technically P2 is Austrian; it used to belong to Austrian lingerie company Palmer’s. However, P2 is so widely distributed in Germany’s drugstore market leader DM chain (and in all of DM’s European markets) that I tend to include it as a domestic brand whenever I write about the German colour cosmetics market! Anyway, a couple of years ago Maesa purchased P2 so there was a huge P2 display at the Maesa stand. I was interested to see that Maesa also has another colour cosmetics brand which is called Flower. The brand’s face is US actress Drew Barrymore and the products are distributed exclusively in US retail chain Walmart. Now Maesa is planning on introducing Flower in Europe; I wonder which market they’ll go in first…? The packaging is a tad clunky for my taste but I liked the gorgeous eyeshadow palettes! 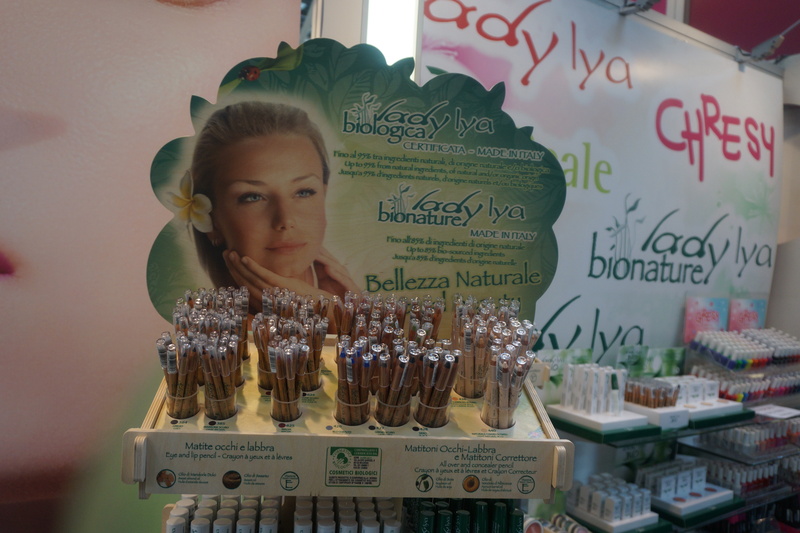 French organic beauty group Léa Nature was also at Cosmoprof Bologna. I had seen the company at Vivaness 2017 trade show in Nuremberg but didn’t have any time to check out the new brand launches. 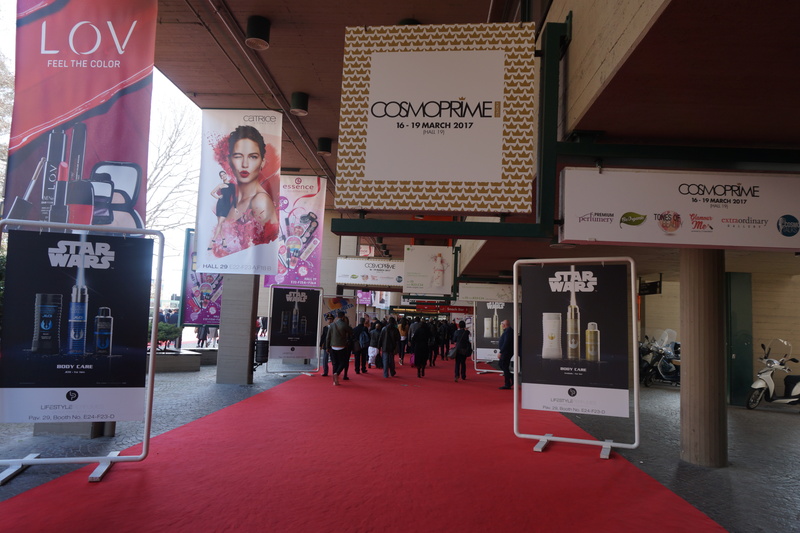 Luckily things were more relaxed at Cosmoprof Bologna so I was able to look at two new Jonzac face care ranges which sounded particularly interesting. Eau Thermale de Jonzac is Léa Nature’s certified organic thermal water brand. 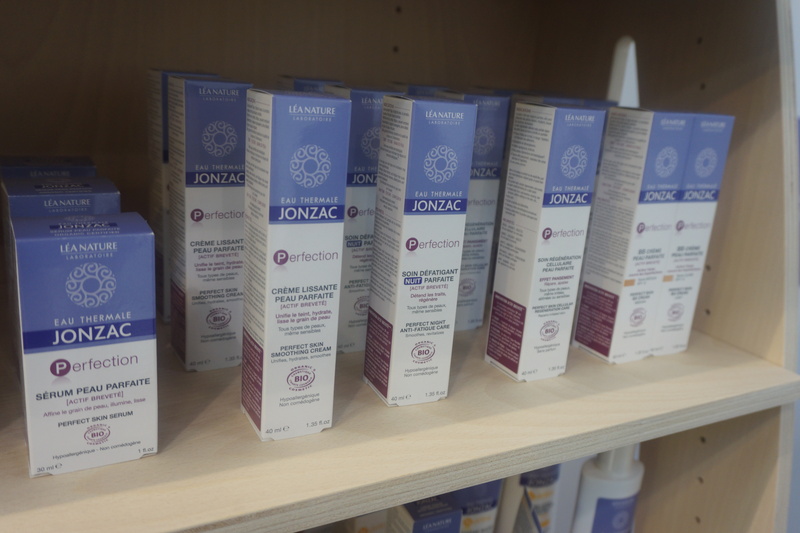 Anyway, Jonzac recently brought out the 5-sku Peau Parfaite range of Smoothing Cream, Serum, Anti-Fatigue Night Care, Cellular Regeneration Care and two BB creams which contains brown algae extract, zinc and witch hazel hydrosol plus the range’s proprietary thermal water. The other new range is Rehydrate+, three products inspired by classic Korean beauty products: the moisturising H2O Skin Care Lotion, a H2O Booster Serum and the H2O Booster Night Gel-Balm. Great textures and a subtle fragrance – typically Jonzac. In Germany, Eau Thermale de Jonzac is sometimes available in TK Maxx stores; whenever I see the products I stock up! And Resibo (picture below) is a nice little family-owned organic skin care brand from Poland. 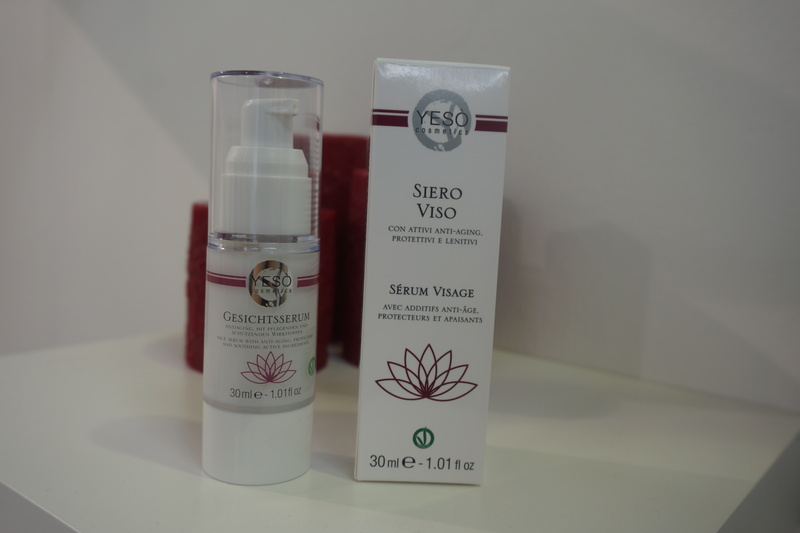 Resibo’s line-up offers nine products: a face serum, a moisturising cream and an extra rich face cream, facial mist, micellar water, cleansing oil, eye cream, lip balm and body lotion. I like the packaging, it really stands out. 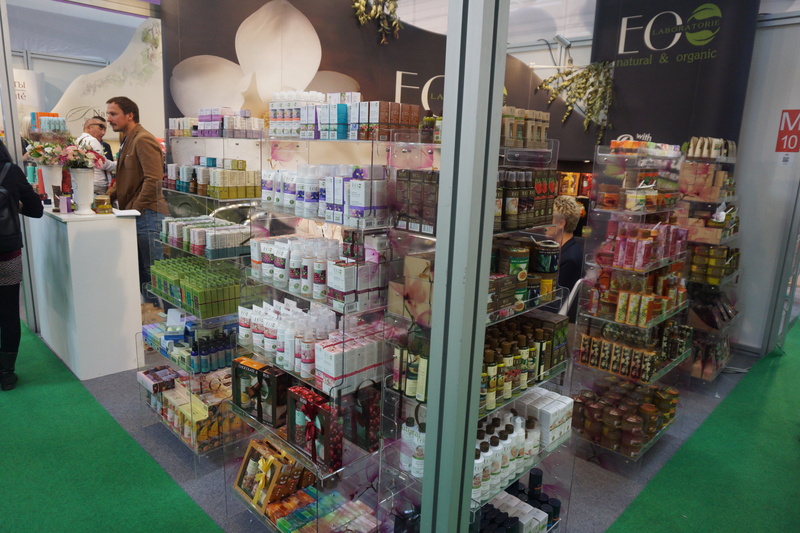 Italian beauty brand Purophi, another exhibitor in Hall 21, also had an eye-catching product display (see picture above). 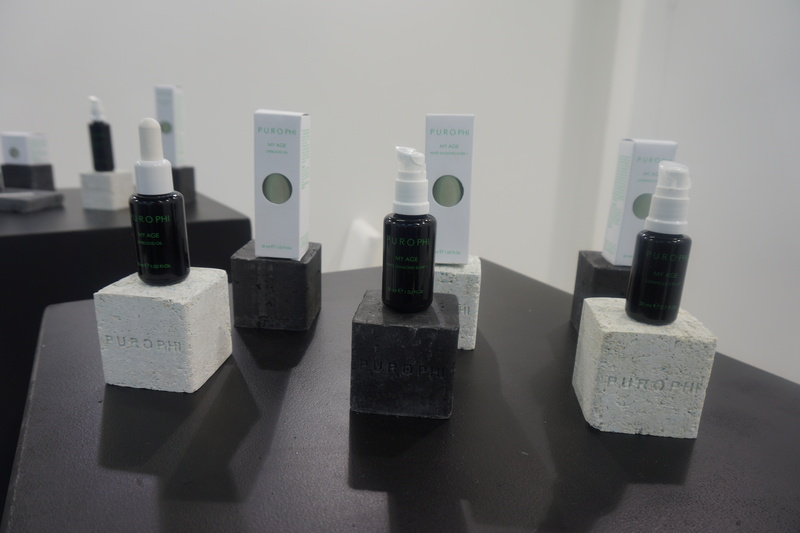 Purophi was founded in 2015; products are certified by the Italian AIAB and the line-up includes eight face care products: a multiactive cleanser, an enzyme exfoliant, a facial tonic with lycopenes, face creams for oily and dry skin, an eye cream, a serum and a face oil. On the occasion of Cosmoprof Bologna, Purophi presented two brand new products: the body care Botanical Black (a body cleanser with activated charcoal) and Botanical White (a body lotion with white truffle extract). Striking packaging, don’t you think? I knew Secrets de Provence from organic beauty blog Beautyjagd but had never actually seen the products, so I was excited to meet the company at Cosmoprof Bologna. Parent brand Ma Provence was founded in 2005, Secrets de Provence joined the family in 2010. Secrets de Provence has quirky packaging – check out the pic above! – and is probably best-known for its solid shampoos and powder shampoos. The solid shampoo in particular is pretty unique, unlike ordinary solid shampoo bars (which tend to be square), Secrets de Provence’s solid shampoos are doughnut-shaped. The brand also offers dry shampoos, powder shampoos which foam up when they come into contact with water, solid face cleansing bars, solid shaving bars and liquid shampoos. Secrets des Provence and Ma Provence already have a pretty solid international distribution, including Slovenia, Slovakia, Austria, Estonia and Lithuania in Europe; Russia, Canada, Kazakhstan and Uruguay. This year the products will also launch in the UK market. In China, Japan and Korea the products are retailed primarily online but they are also available in selected Olive Young drugstores and Lotte department stores. 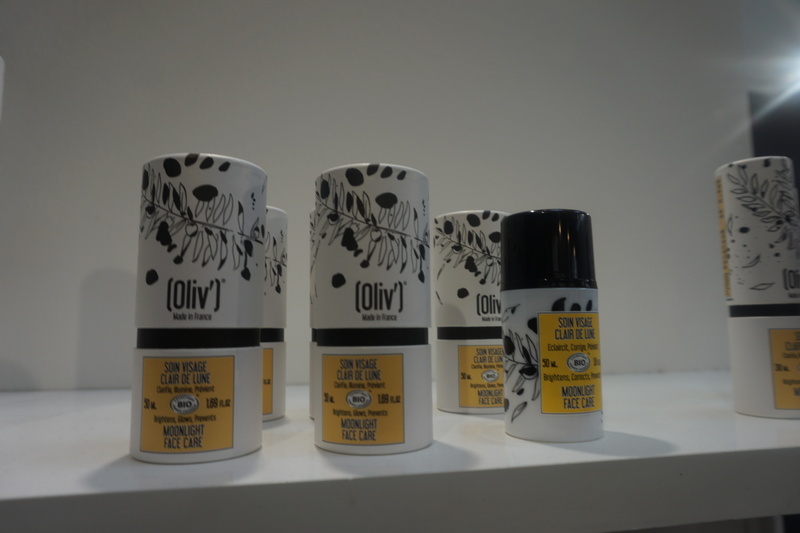 Oliv’ is another very cool French brand from the Provence region. All Oliv’ products are formulated with anti-oxidant olive leaf extract and the recently relaunched packaging is beautiful; check out the round cardboard sleeves decorated with olive leaf drawings! The company was launched in 2006 and there are currently 17 sku of skin and body care. The face care line-up includes five face creams for different skin types, two serums, an eye gel and two toners. There was one especially interesting-looking range, the yellow-packaged Clair de Lune/Moonlight brightening line. This product range was actually developed for the brand’s Asian markets. Although Oliv’s products are also distributed in European countries such as the Netherlands, Belgium, UK, Switzerland, Slovakia and Denmark, the company’s most important regional business is in Asia. Oliv’ is retailed in Japan (where the products are available in Japanese organic perfumery retail chain Cosmekitchen’s outlets), Taiwan and Korea (in selected Olive Young drugstores). Organic beauty brand Bioofficina Toscana is from the Tuscany region of Italy. 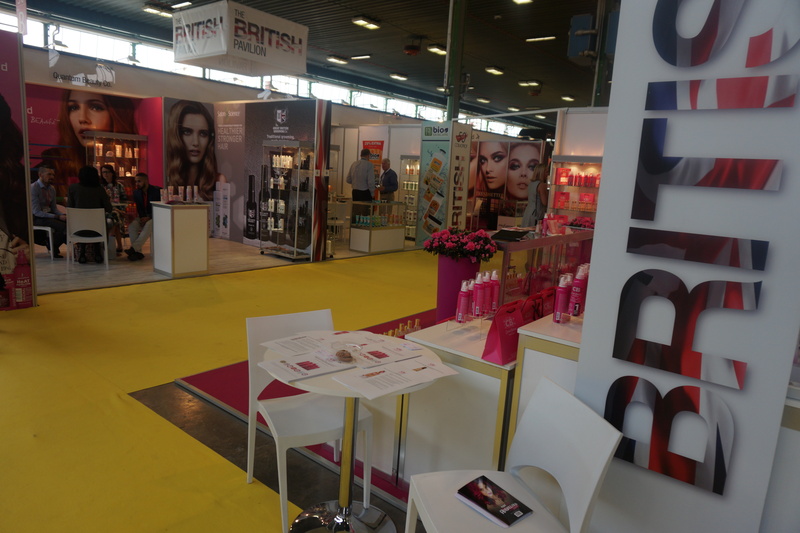 I had first met the company at last year’s Cosmoprof Bologna. 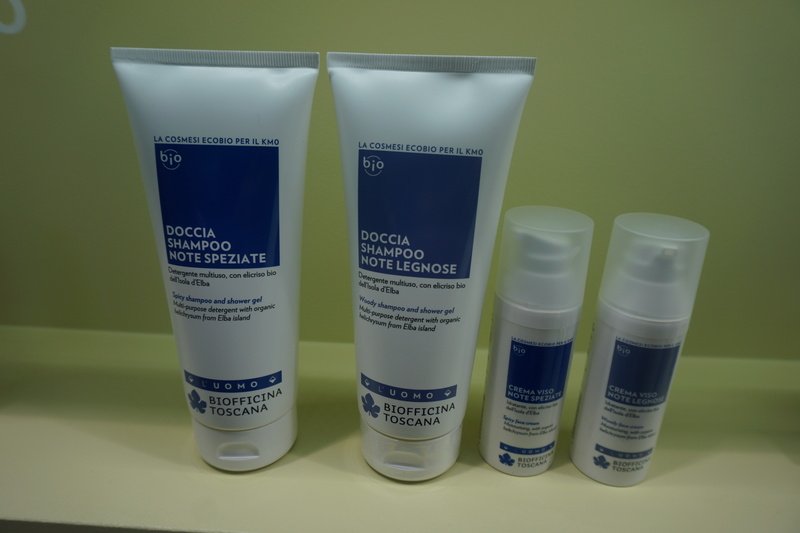 Bioofficina Toscana offers a wide range of skin and body care and at this year’s trade show, the brand presented their new 8-sku L’Uomo men’s care range. The line includes four products which are each available in two different fragrances – a great product concept. 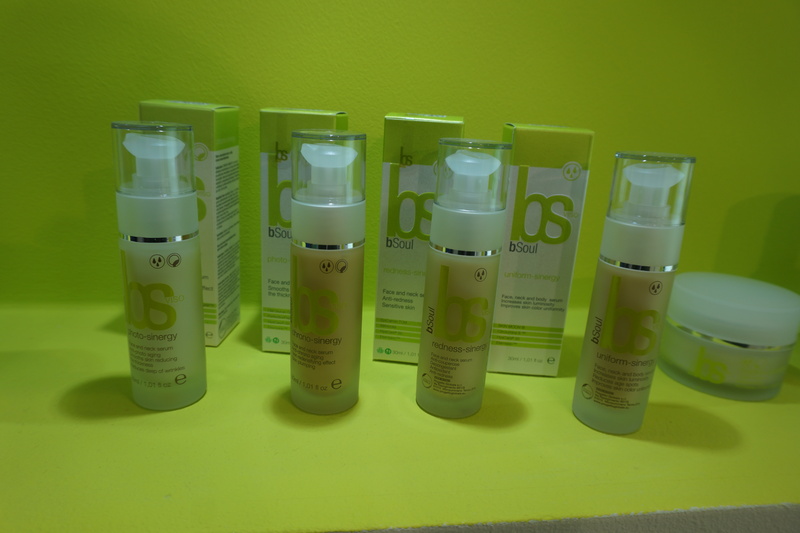 BSoul is another organic beauty brand from Tuscany (see picture below). BSoul was launched in 2012 and the ICEA-certified products are manufactured in Tuscany (including packaging and logistics). The line-up includes a basic skin care range with five skin care products and three body moisturisers; the Redness-Sinergy range for sensitive and irritated skin which offers four different serums that target specific skin problems, the Special range with a Start-Up Renew Gel formulated with mandelic acid, a face scrub, a skin-brightening serum, a rich moisturiser and three body care products. Italian brand Yesò was founded in 2015 and the company’s vegan 19-sku portfolio of face and body care is certified by Natrue. Yesò’s line-up offers 10 oils for hair skin and body, 6 face care products which include a serum (one of the brand’s bestsellers, see picture above), eye cream, day cream, night cream, cleanser and toner; a hand cream and a body lotions. 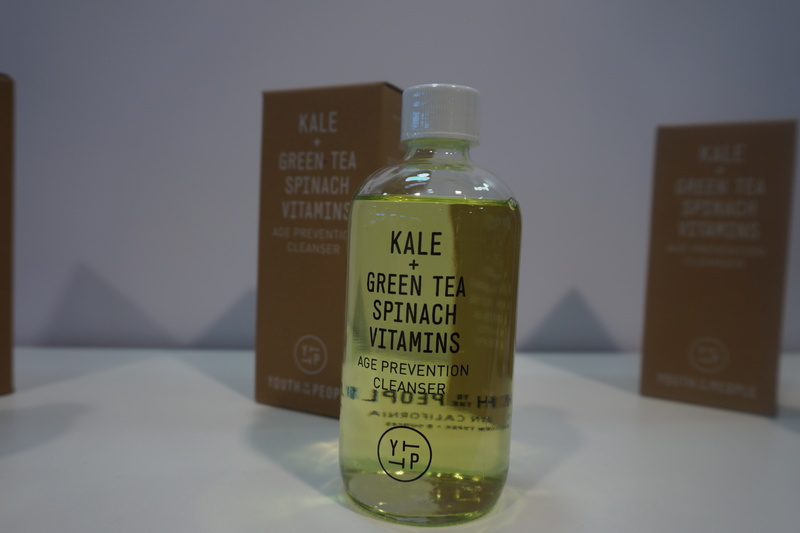 Yesò’s products are already available in Hong Kong and Cyprus and even in Germany (with a small distribution) and the company is hoping to expand its international presence further. Vis-à-vis from Estonia-based natural manufacturer EuroBiolab (producers of the Oma Gertrude organic skin care range and part of Natura Siberica’s empire) was another organic company from Russia: EC Lab. EC Lab offers an extensive portfolio of hair care and styling products, bath and shower, body care, spa care, face care, baby care and men’s care. 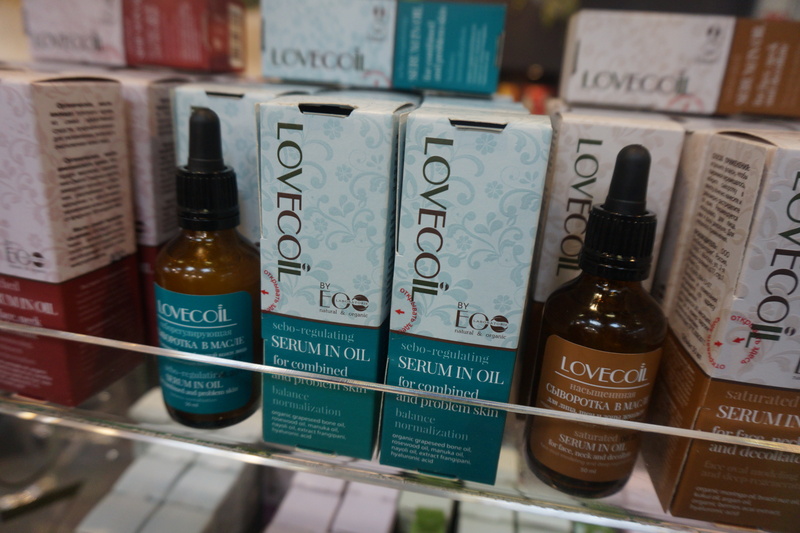 I particularly liked EC Lab’s LoveECOil range of skin and body care. All products are based on plant oils; there are face oil blends, oil creams, even an oil-based hair treatment. Last year LoveECOil was extended with the Oil-in-Serum range of intensive treatments. Packaged in apothecary bottles with droppers, the range offers four serum variants: Sebum-Regulating, Moisturising, Regenerating and Lifting. You shake the bottle to mix the two phases and then apply a few drops of the product on your face. Another product which looked intriguing was the Revitalizing Facial Mask, a self-heating mask with curcuma extract. LoveECOil (and EC Lab’s other product ranges) are retailed through the company’s own website euroshop.eu in eight European countries. Organic colour cosmetics brand LadyLya from Italy was founded 27 years ago. In 2002 LadyLya’s products received the organic certification and today the brand’s 88 sku are sold in the Netherlands, Belgium, Portugal and soon they will be available in the UK. All of the products are made in Italy; in its domestic market LadyLya is sold in pharmacies and erboristerias. And back to organic beauty from Poland! I had met the founder of Polish brand Naturativ during a press trip to Warsaw in 2014 and have followed the fortunes of Naturativ ever since. 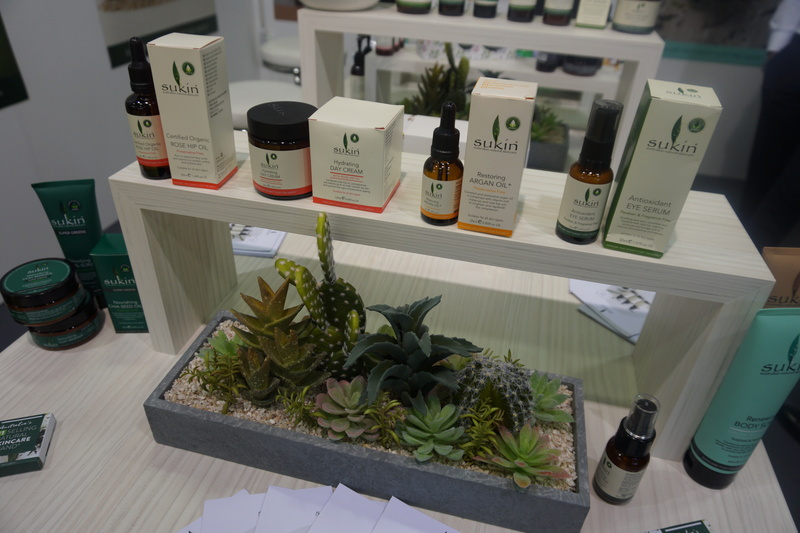 The products of this charming beauty brand are certified by Natrue and Naturativ had its exhibition stand in the Natrue area of Hall 21. It was great to catch up with Naturativ; the brand’s latest launch is the 4-sku 360° range of anti-pollution skin care: a cleansing milk, face cream, toner and face mask (see pic below). 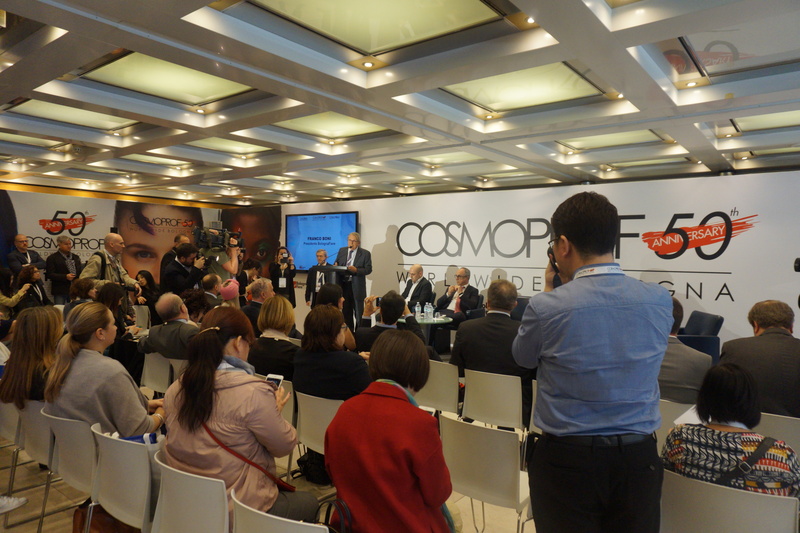 As always, Cosmoprof Bologna 2017 was accompanied by a comprehensive conference programme. I attended several lectures – I can never resist anything to do with trends or market research! – including the WGNS Trends Talk on the first day of the trade show. One of the three panelists was Christina Fontana from Alibaba Italy. Alibaba is the biggest e-commerce retailer in China and has an enormous economic influence. Alibaba’s two main retail platforms are B2C (business to consumer) T-Mall – there is T-Mall Global for brands that are not registered in China and T-Mall for companies whose brands are already registered – plus Taobao, a C2C (consumer to consumer) platform. This is Alibaba in a (very small) nutshell; if you want to find out more, they have an excellent media service. Alizila offers press releases in English about anything to do with the Alibaba universe and the Chinese e-commerce market. Seriously, you can download Alibaba’s financial reports in English; I wish other Asian companies offered this kind of service! Anyway, Alibaba’s influence in China and across the world will only continue to increase, and rapidly so. I started to research the Alibaba group last summer when I wrote a couple of articles on the Chinese cross-border e-commerce market for Organic & Wellness News and SPC Magazine. And I’ve been fascinated by the Alibaba conglomerate ever since. But enough about that, and back to Christina’s presentation. She said that most of Alibaba’s future growth is slated to come from China’s rural areas rather than the urban centers. And indeed, the Alibaba group is currently investing into the infrastructure of many rural areas in China’s – in tier 3, 4 and 5 cities – building warehouses, distribution centres and logistics services. Chistina also explained that on average the Chinese consumer has seven touchpoints (i.e. interactions) per brand. This means that he or she will look at products online, check out what their friends have bought, read reviews about the products and so on; they’ll repeatedly interact with the brand throughout the day. And over 80% of e-commerce turnover comes from mobile phone transactions. So if you want to market a brand effectively in China content creation is key, Christina said. It is especially important to work with digital opinion leaders (influential bloggers, youtubers, brand ambassadors). At the same time, Alibaba is seeing another retail trend: online to offline – the Alibaba group recently opened bricks ‘n mortar stores in mainland China. I also attended the presentation of Mintel’s Maesa Lhopez on Saturday morning. Maesa spoke about how the K-beauty trend is influencing the global beauty market. Her slideshow was full of lovely market data – yes, I admit that I am partial to Mintel’s market research products and not just because I was their German GNPD beauty shopper for several years! GNPD (Global New Products Database) is a fabulous database; check it out here. Seriously, I can’t oversell this; if you’re interested in product development (in food or cosmetics) across different regional markets, this is the place to go to. Anyway, returning to the presentation. Lhopez said that Korea is the 10th biggest beauty market worldwide (and as far as skin care is concerned, it is the global #3 market); with Amore Pacific and LG & H as the two largest beauty manufacturers. The figures she presented showed how exports from Korea are growing while imports are stagnating. At the moment, Korean exports are primarily in skin care although the colour cosmetics and hair care categories are slated to grow in importance over the next few years. Looking at individual product trends, Lhopez highlighted the sheet mask category. Sheet masks are diversifying very quickly at the moment – forget the classic sheet masks of yore (or, say, of ten years ago); today there are different types of cotton sheet masks, Tencel sheet masks, cellulose sheets masks, hydrogel masks, bubble sheet masks; add the modelling masks, splash masks and jelly mask trend to the category and you have an enormous variety of facial masks. Within the sheet mask market there is a distinct premiumisation trend – actually, this is something that is influencing many product categories at the moment – with luxury ingredients, “injection” masks and 3-step masks (three different mask for different facial areas in one pack). Cushion foundations are also making their presence felt in the West, although Europe is lagging a little behind the US in that respect. After all, L’Oréal only launched its first European cushion foundation last year. However, once L’Oréal has a product out in the mass market other brands will follow (vide how the first European BB cream launch from L’Oréal’s Garnier brand kickstarted the BB cream category in Western Europeall those years ago). Transforming textures are also a key trend: water to oil, sherbet to oil, gel to foam; it’s a highly innovative category, Lhopez said. Western retailers – especially US stores – are starting to add K-Beauty brands to their line-up while Western beauty brands are increasingly opening flagship stores in Korea. The cultural exchange goes both ways, so to speak. And trends to watch out for in 2017 include the introduction of new cleansing products for morning and evening cleansing routines, natural ingredients, products with fewer ingredients, professional salon-style treatments; the convenience format, men’s care and products with protective ingredients (anti-pollution/anti-oxidant/sun protection). Also on the K-Beauty panel was Lucy Whitehouse, editor of trade magazine Cosmetics Design Europe. 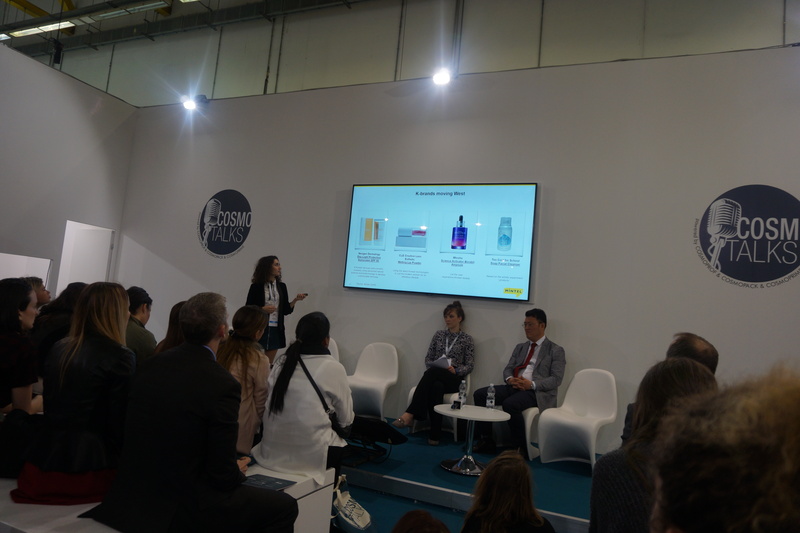 Lucy outlined a number of trends in the Korean beauty sector, including the developing middle-class demographic, the expansion of private label brands, increasingly complex skin care routines, how brands are maximising its digital potential and as a key product category, essences. However, SNP’s single bestselling sheet mask is the cellulose mask “Bird’s Nest Aqua Ampoule”, Cho said. He also added that mainland China is one of the most important markets for SD Laboratories – the Chinese market for sheet masks is ten times as big as the Korean sheet mask market. 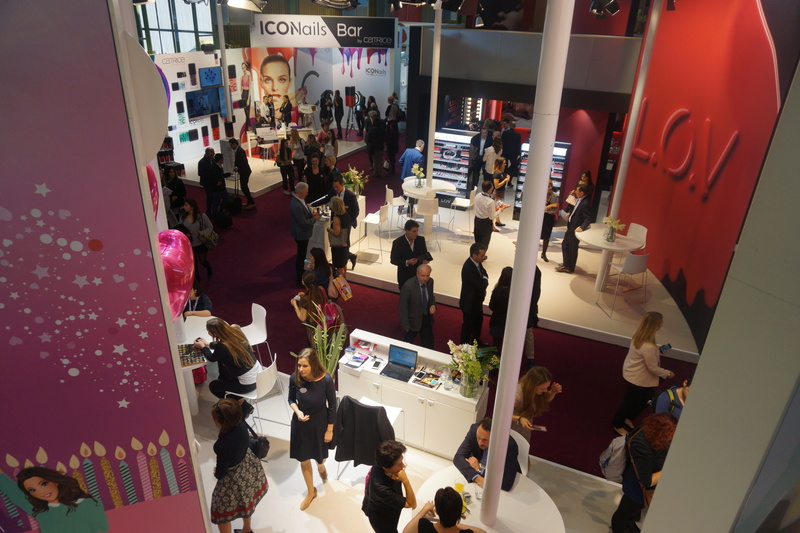 This was a small glimpse of Cosmoprof Bologna 2017. I could have written so much more – and 5300 words on a trade show report isn’t really that excessive by trend-traveller.com’s standards (I think my longest ever trade show article was close to 8000 words!). However, next weekend I am attending Beauty Düsseldorf, the biggest German salon C&T trade show, and in exactly one month I am flying to Asia for an international trade show extravaganza: first Cosmobeauty in Seoul, then Beautyworld Japan in Tokyo and finally China Beauty Expo in Shanghai. So you can expect more trade show reports in the future! And speaking of new international trade shows: At the opening press conference of Cosmoprof Bologna, BolognaFiere’s president Franco Boni (see picture above) announced some exciting news. Not only is Cosmoprof Worldwide cooperating with one of the largest beauty trade shows for the Gulf and Middle Eastern regional market – Iran Beauty & Clean – but Cosmoprof will also extend its network of international trade shows over the next five years; in cooperation with various international partners BolognaFiere is planning new Cosmoprof offshoots in Mumbai (India) for the Indian Sub-Continental beauty market and in Bogota (Colombia) for Latin and South America. Yay!! 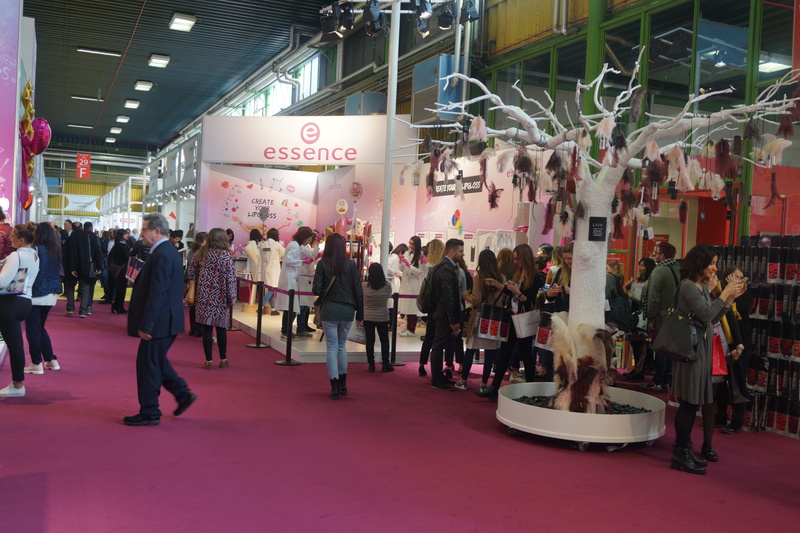 The next Cosmoprof Bologna trade show will take place from 15th to 19th March 2018.